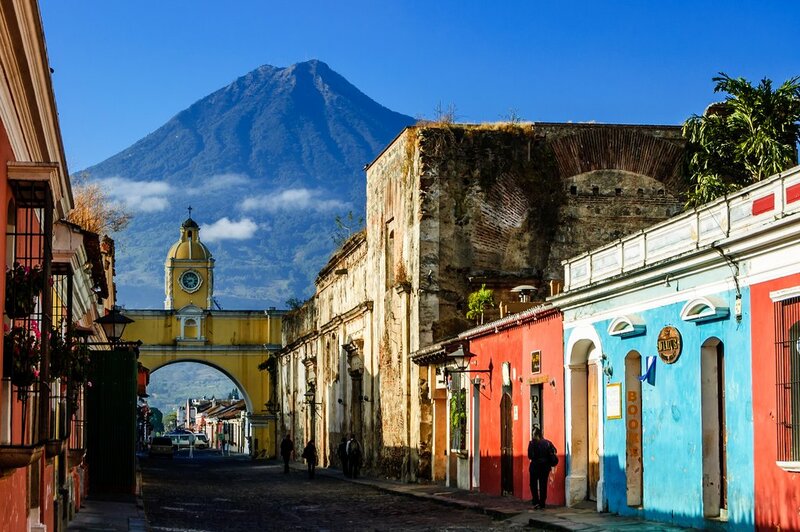 When you land in Guatemala City, your driver will meet you at the airport and transport you to your hotel in the nearby colonial city of Antigua. Set amid a backdrop of three volcanoes, it's easy to see why this colorful city is a designated UNESCO World Heritage Site. Antigua is filled with ornate Spanish baroque architecture and charming pastel facades, and is blessed with spectacular mountain views. Spend the rest of your day roaming the quaint cobblestone streets, browsing vibrant craft markets, and sipping locally grown coffee while people watching in Parque Central, the city's main plaza. Gear up for an action-packed day on the trails of El Zur Mountain Bike Park! Located in the foothills of the Volcan de Agua, this private park offers over 15 miles (25 km) of manmade trails. 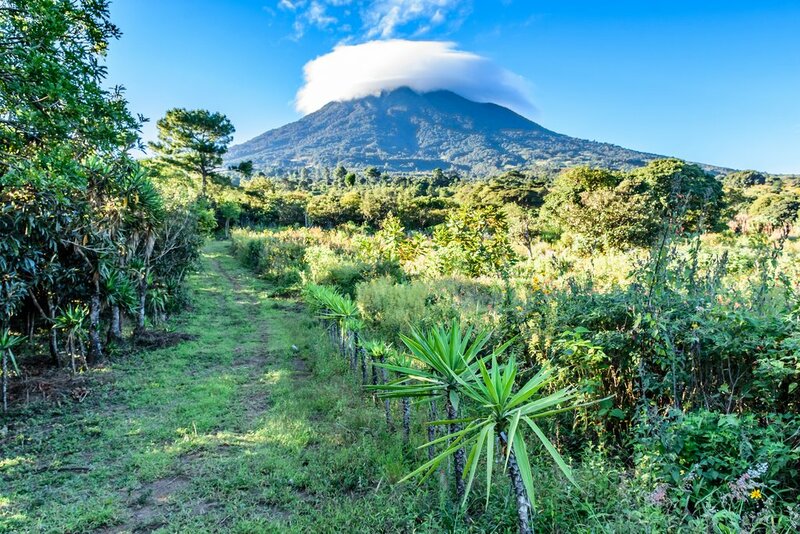 Take the 4x4 shuttle to the top of the reserve at an elevation of 8,500 feet (2,590 m), and then cycle down the rolling jungle paths of the volcano in a thrilling descent. You'll have lunch on the trail, and return to Antigua for the evening. Take it easy and rest up ahead of tomorrow's challenging hike. After breakfast at the hotel, you'll set out to the village of La Soledad, about an hour's drive from Antigua. 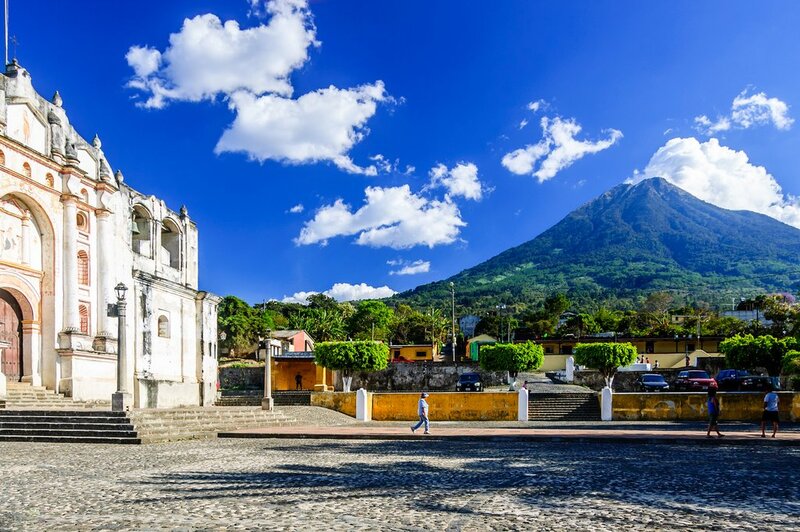 This sleepy village is nestled into the mountainside of Acatenango, the third tallest volcano in Guatemala. You'll hike through four distinct microclimates on your way to the top, each taking around an hour. The first leg will take you up a steep trail through farmland used by villagers to grow corn, snow peas, and lilies. You'll continue on through a tropical cloud forest, featuring some of Acatenango's oldest trees and most varied biodiversity. It's also home to Guatemala's national bird, the strikingly colored quetzal. Once on the other side of the cloud forest, you'll be rewarded with a picnic lunch with sweeping views of the surrounding volcanoes. 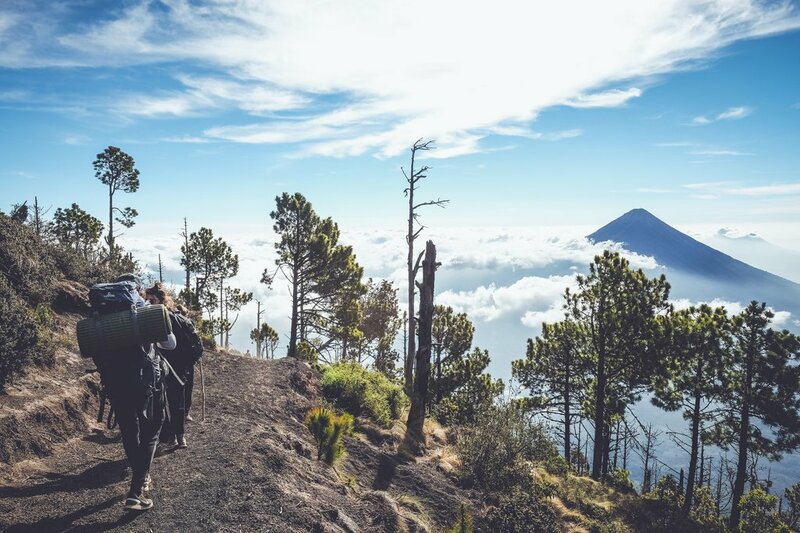 After lunch, the trail will lead you through a temperate coniferous forest up to the tree line of the volcano, where you'll set up camp for the night at an elevation of 12,300 feet (3750 m). Relax for the rest of the day as you take in panoramic views of the Antigua valley below and the neighboring Volcan de Fuego, a very active volcano. Get cozy with some hot tea or coffee as your guides prepare a fresh dinner. 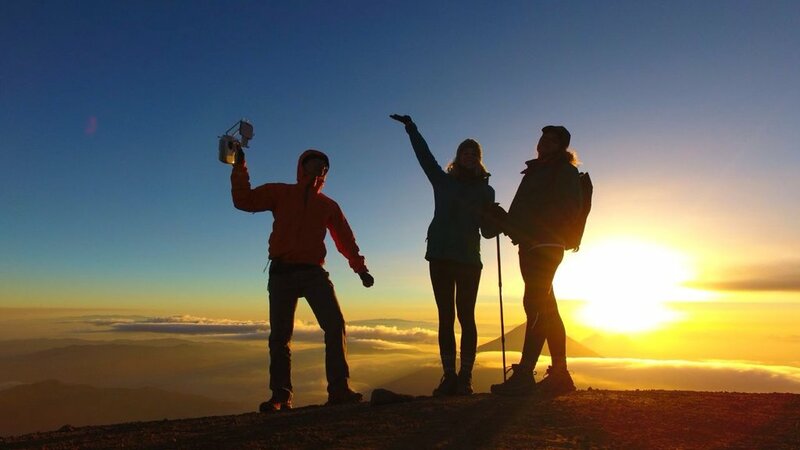 You'll have an early morning today so that you can reach the summit of Acatenango in time for an unforgettable sunrise over unspoiled views of the Guatemalan highlands. On a clear day, you can see all the way to the Mexican border! You'll return to the campsite for breakfast, and then begin your descent to La Soledad. From there, you'll return to Antigua, where you'll have the rest of the afternoon to spend as you like. Sample the delicious street food Guatemala is famous for, like elote (corn on the cob), tacos, and rellenitos (fried plantains stuffed with refried beans). Pay a visit to some of the dozens of beautiful churches around the city, like the bright yellow La Merced or the San Francisco Church. Meander through some of Antigua's many art galleries, or take a salsa class and dance the night away. 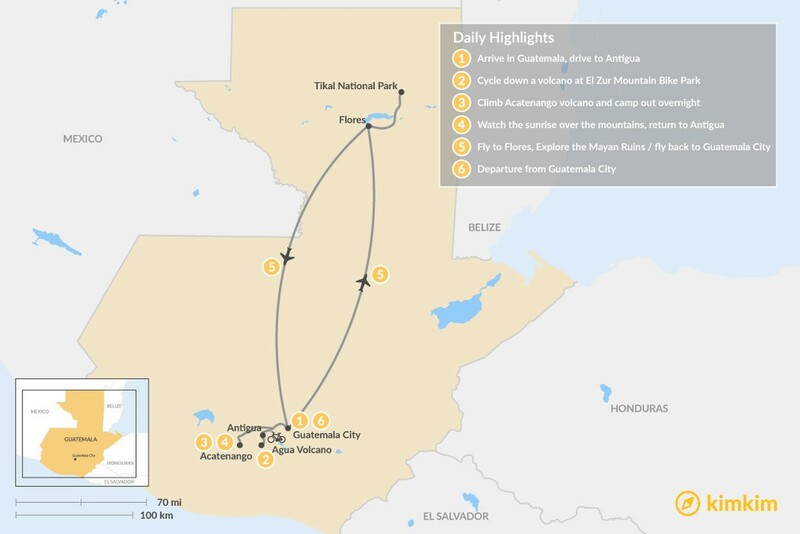 You'll have another early morning and a quick local flight to the town of Flores in northern Guatemala. A shuttle bus will take you from the airport directly to Tikal National Park, where you'll explore the ancient Mayan ruins. Situated in the heart of a lush rainforest, this vast network of limestone pyramids and temples dates back to the 6th century B.C. 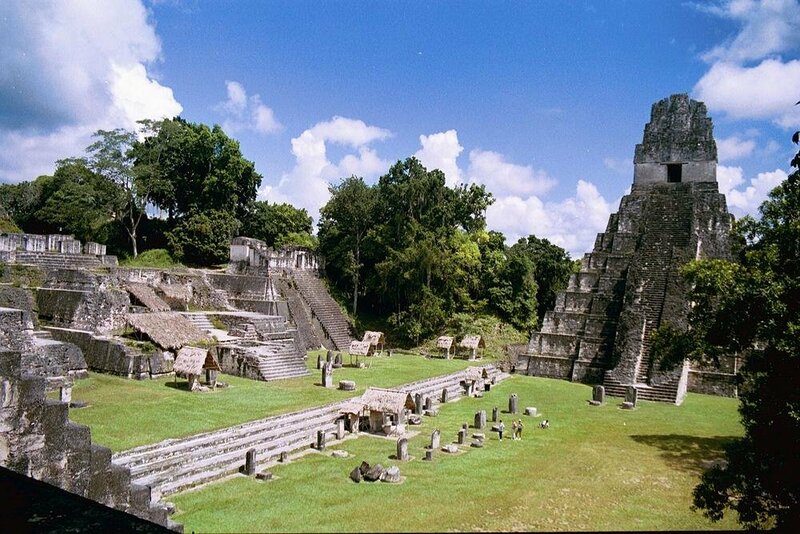 and is among the most impressive archaeological sites in Central America. Wander around the palaces and monuments, decorated with stone carvings and hieroglyphics. Learn how this sophisticated culture accounted for everything in its city from ball game courts to irrigation to designated outlets for artistic expression. Enjoy a relaxing lunch in the park in your tropical surroundings. Listen to the jungle sounds as you keep an eye out for animals like parrots, howler monkeys, and anteaters. Big cats like jaguars and pumas have been known to roam the area as well. In the evening you'll fly back to Guatemala City, where you'll spend your last night. After indulging in a hotel breakfast, say your goodbyes to beautiful Guatemala and head towards the airport for your onward flight. Chris picked perfect activities for our trip. He understood our needs and customized our tour to our liking on the first try! 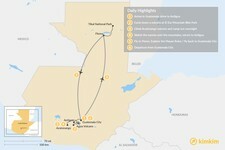 Our guides were young and fun and made sure we got to our destinations. They were early/ontime and provided insightful stories into the Mayan culture in Guatemala. We loved each tour and the local connections each guide had which made our trip more special. Chris, our local specialist did a phenomenal job at creating a customized itinerary on a very short turnaround when our travel plans changed right before our trip started. Chris was also really helpful in changing around our plans when there was an unexpected sickness on the trip. All of our guides were amazing. Manuel took us on a walking tour of Antigua which was a great way to start off our trip. In Monterrico, we had a really fun and relaxing afternoon kayaking with Alex. Alex was also able to help us when our transportation fell through last minute which was invaluable. My favorite day was our tour around Lake Atitlan. Edgar is really knowledgeable and was able to answer all of our questions. He showed us the beautiful town of San Juan where we explored the women's textile co-op and did some shopping. 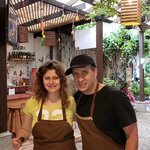 Our last day, we took a cooking class at Guatemala Food where we made a yummy and traditional dish of Pepian with Fernando, Joaquin, Carolina, and her family. The class was a really great way to end our trip and the group was really funny. I'm so happy we chose to use KimKim and were partnered with Old Town Outfitters to assist with our trip! Our trip to Guatemala wouldn't have been the same without them.